If you are unlucky enough to live in an area where there are many wild deer, you are probably having problems with the deer eating your trees and plants. You might also worry because deer carry so many Lyme ticks. The most common deer is the white-tailed deer-Odocoileus virginianus, also referred to as the Virginia deer or the whitetail. This medium-sized deer is native to all but five of the states in the United States. Its territory spreads north through the southern regions of Canada in the provinces of British Columbia, Alberta, Saskatchewan, Manitoba and Ontario as well as south through Mexico, Central and South America as far as Peru. The white-tailed deer has also been introduced to some countries in Europe and New Zealand. When TheGardenLady was a child this deer was hunted for food. But today many towns outlaw hunting or only allow it for a short period of the year. And most dogs that would frighten the deer away now have to be fenced in or kept on a leash or chain when outdoors. So the deer have become a major nuisance. You might be considering permanent deer fencing, or fencing hire to begin with, to see if this is a deterrent to the problem. First remember to find out what the law says in your area. Find out whether there are any legal restrictions to putting up a fence on your property. If you can afford to have deer fencing and your township allows fencing, ask about the dimensions – height and/or width- and the materials. A neighbor who put up beautiful deer fencing had been told that 7 feet was high enough. And most of the time that height seemed adequate. Then one day, white tailed deer jumped over the fence. Today most extension material will say that white-tailed deer can jump up to 8 feet and some sources claim than when pressed deer can jump up to 10 feet. In my neighbor’s case, the deer had been able to make the running jump to get over the 7 ft fence but then they could not get out. Perhaps it was because deer have poor depth perception or there was not enough room to do a running jump to get back out. Thus my neighbor had to hire some people to take down part of the fence to chase the deer out and then put back the fence. 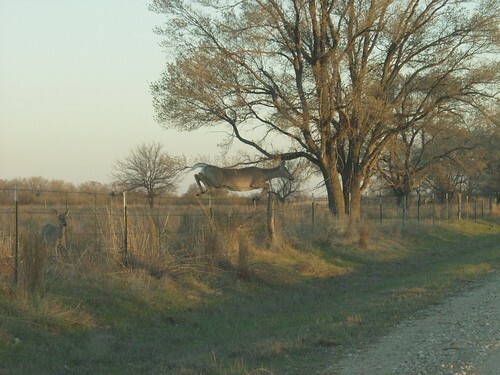 So if you want to keep white tailed deer out of your property, be sure that a new fence is at least 8 feet tall according to agricultural extension articles. Much taller is not really necessary. TheGardenLady understands that you may already have been sold a shorter fence than the 8 ft recommended and you don’t want to have it taken out and replaced. One can talk to those who built the fence to ask them to add additional height. Or they can add width to the existing fence. If there is enough space, one can put up a second fence around the original fence but it has to be at least 4 ft away. The deer cannot jump the two fences. Still TheGardenLady would worry that the deer might get caught between the two fences so that, like my neighbor, you might have to get the deer out. Deer can jump high but they cannot jump both high and over a wide enough space. A fence does not have to be as tall if it is made on a slant. You may get away with a six feet tall fence if it is slanted outward at a 45-degree angle with perhaps a few strands of additional wire on top for extra height. The slant makes the fence, in effect, wider so the deer won’t be able to jump over this. The deer will first try walking under the fence and meet resistance and not backtrack to try to jump it. Fencing can be made of different materials. If you can put up a wooden fence, or a fence that deer cannot see through these fences are quite effective in keeping deer from jumping over them. When deer cannot see what is on the other side they fear there is danger lurking. Thus you may get away with a shorter fence. But you can also add some extra wiring at the top to ensure no deer jumps over. There are cheaper plastic materials on the market whose sellers claim they are successful in keeping out deer. TheGardenLady does not know how successful these materials are especially when one lives in areas where there are a large number of deer. Such a good article. Deer are certainly good at defying the odds. It’s amazing how high they can jump!